Our dog Hanah has been fast getting to the point she cannot use her back legs well to walk and just this week she began needing assistance going up and down steps. It seems the end of her life is now at hand. Of the dogs we have had, Hanah latched on to me more than any, probably because she was trained by a woman who had similar features, so I was her alpha. I did not take to Hanah as easily as she did to me, although I often thought it funny when my husband, who is usually seen as the alpha in our home, would give an order and Hanah would look to me for the final approval. Hanah was Schutzhund trained so we had to command her in German mostly, although she also remembered some Czech commands from her homeland. 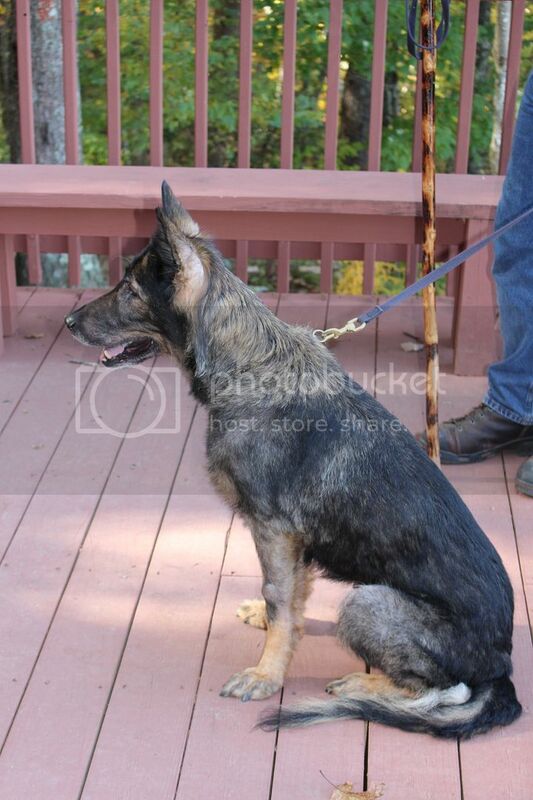 She was brought from Czechoslovakia by a breeder/trainer in Ohio, the one I resemble, where she was further trained. Unfortunately, she has always been a very hyper dog and a bit clumsy even though well past the puppy years. She had been sold to an older couple who found her too much for them and brought back to the breeder within a few weeks. She also worked as a border patrol dog in Texas for some years but again was sent back to the breeder because she was having problems with her eyes. You can read about more about that in Who Let the Dog Out? This picture is of her when we went to north Georgia in October last fall in her calmer state, or a bit worn out, perhaps. You would never have known that Hanah's nickname became Tail of Destruction, but it sometimes was Head of Destruction or Body of Destruction or just plain Dog of Destruction. I honestly cannot tell you how may times in her exuberance that she knocked things over with her tail, or turn too fast and hit her head into a corner of the wall or furniture, or just practically knocked me down on the stairway. She always had this habit of wanting to go before me so she did not follow me as much as walked fast to get in front of me and then stop or turn to see where I was going from a particular pivotal point. If I was going straight without stopping also, I often nearly tripped over her. She had a true knack for being in the way and I do not think I have ever said "move" so much to all the pets of my life summed up as I have to Hanah. I just never could get her to follow or even just stay along side of me, unless I put her back into her duty mode to make her "foos" (heel). Our time with Hanah has been short because she was six years old, the height of a GSD's prime, when she became a part of our family. Now she is thirteen. As she aged, her hyper activity calmed down some. I used to say I could just tap a toe lightly and she would be on her paws ready to go. Honestly, any move I made she would jump up as if on duty. She did not do this with my husband or daughter so much. Although she loved to chase things in the begining, she has not been a very playful dog, everything seem to be about duty with her. I would remind her that she was retired and to relax. She always followed me from room to room, mostly trying to get a head of me, but with her hyper activity and clumsiness, I found that irritating much of the time. She always has looked to see where I was; if my husband fed her, as soon as she scarfed down her food, she would be searching for me if I was not in sight. Whenever I would go outside to garden without her, she would look out the windows for me, going back and forth until she could see me, but for the last couple of months she would lie by the front door as that is the one I use the most. Although the past couple of years I have enjoyed her more relaxed attitude much more where I can step over her now and then, now I am realizing that the past few months, she is not just more relaxed but incapable of doing what she used to do. Funny how the very things that irritated me are now the things I am beginning to miss her doing, but that is how it is with loved ones. My Lord, thank you for the times we have had together with Hanah. Hanah got better for a few days with of my treatments. In fact in just a few days she was following me around again, but then in just another day or two she could not stand up because she had no control of her back legs...and she actually looked so very sad. We said good-bye to her on Saturday morning, the 16th.